Anticancer agent. Inhibits depolymerization of microtubules, causing mitotic arrest in cancer cells, and apoptosis. Note: Some researchers have found solubility issues in PBS. The recommended procedure (from researcher feedback) for successful solubilisation is as follows: Solubilise 10 mg of ab120143 in 1.25 mL ethanol absolute, mix well, add 1.25mL Cremophor, homogenise. Store at -20°C and after 24 h, defreeze quickly and solubilise in PBS, no crystallisation observed. Please note, Abcam has not yet tested this method. 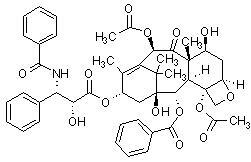 Functional Studies - Paclitaxel, Anticancer agent (ab120143)Dong et al PLoS One. 2013; 8(12): e83519. E2 inhibits Paclitaxel induced androgen-independent prostate cancer cell death. (A-D) 100 nM of E2 was added to the media of (A and B) LNCaP and (C and D) PC3 cells for 96h, followed by addition of Paclitaxel at the indicated concentrations for 24h. The cells were stained with Hoechst 33258 (5 µg/ml) to visualize nuclei and propidium iodide (PI) (0.2 µg/ml) to detect membrane damage (B and D). Cell death was quantified by scoring the number of PI positive cells relative to the total number cell nuclei in the same visual field (A and C). The values represent the mean ± S.E. of at least three independent experiments. * denotes p<0.05, ** denotes p<0.01, and *** denotes p<0.001. (From Figure 1 of Dong et al). Publishing research using ab120143? Please let us know so that we can cite the reference in this datasheet. Microtubules (MT) were isolated from SH-SY5y cells using protocol outlined in: Sloboda RD. 2014b. Isolation of microtubules and microtubule-associated proteins using paclitaxel. Cold Spring Harb Protoc doi: 10.1101/pdb .prot081190. Following isolation, 20 μg of protein from the MT extract was immunoblotted for detecting B-3-Tubulin (Primary antibody - 1:500 dilution overnight, Secondary antibody (ab6728) - 1: 2000 dilution for 1h).